Amara the Magnificent is a Serenian warrior, a legend among her people—a famous race of female warriors. She disappeared shortly after becoming champion at a tournament and was never heard from again, leaving behind Maryan, a young daughter. Maryan knows she has some big shoes to fill among these warrior women and struggles not to let her people down. But she has only a few close friends to help her. Most of those who train with Maryan are jealous that she is the daughter of a legend and are constantly testing her. It doesn’t help that some of Amara’s old companions are now in charge of training the young girls. They show Maryan no favoritism, and if anything, are harder on her than the rest, especially Asti the Red. Once regarded as Amara’s best friend, Asti now considers her an enemy, betrayed by the famous Amara. Before she disappeared Amara took off half Asti’s face with a blade in a contest to see who would represent Serenia in the tournament and become champion. The Serenian queen banishes her own daughter from the kingdom to replace her position with Maryan, opening up a whole new set of problems for the young girl. Within a short time Maryan is sent off to be married to a prince from another land in order to produce an heir. She only learns later that the prince wasn’t told she’d been forced into the union. He is a kind man and she eventually falls into love with him, accepting her place by his side. But Maryan was chosen as his wife because it was thought she would produce a female child, one who could be used politically for another arranged marriage. When Maryan has a son instead, her life is once again turned upside down, her enemies determined to kill the child, a child in line to rule once his father is killed. I was surprised by how quickly I became caught up in Maryan’s problems, beginning on page one and not slowing down for a second until we reach the end. Along with Maryan we find an entertaining cast of characters, including a crippled rat, a blind lion, and a baby dragon that can breathe fire, a dragon that doesn’t stay a baby for long. The surprise is that they can all speak to her through telepathy and go far to help keep Maryan out of harm’s way. 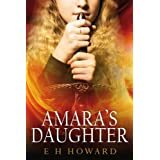 For all of you who love fantasy romance by authors such as Sherrilyn Kenyon, I think you’re going to love Amara’s Daughter. It is a fast, fun, exciting read and I know I enjoyed every minute. I can’t wait to read the next one by this imaginative author, E H Howard. I’m hoping we’ll get to learn what happened to Amara the Magnificent one day soon. Posted by Denna Holm on June 26, 2013 in Archives and tagged cursed, dragons, fantasy, fantasy romance, five star review, legends, Romance.